from 60 pcs. 0,24 EUR ea. from 140 pcs. 0,21 EUR ea. from 360 pcs. 0,18 EUR ea. 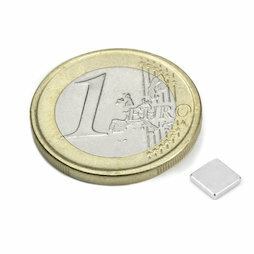 This very small block magnet holds, for instance, 2-3 A4 sheets. It looks really good when you use 2 or 4 magnets per sheet. Very discreet with only 1 mm thickness.